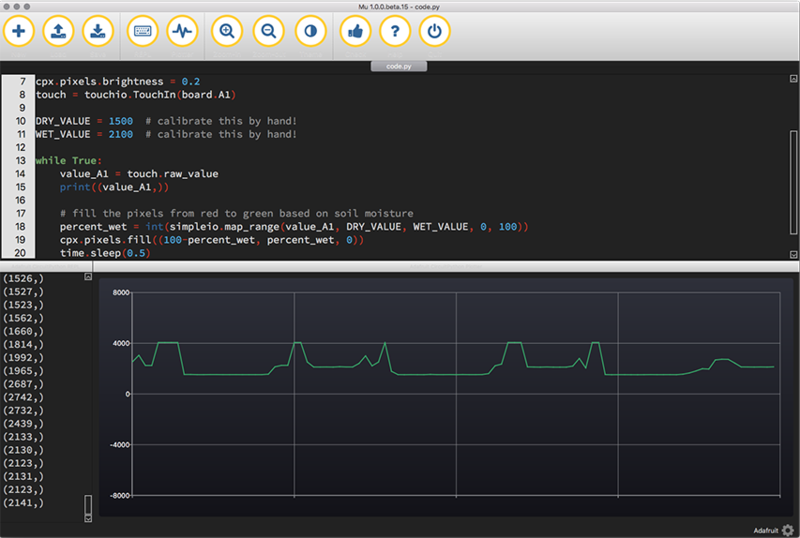 Guide Update: Sensor Plotting Soil Moisture with Mu and CircuitPython « Adafruit Industries – Makers, hackers, artists, designers and engineers! We’ve been doing a bunch of sensor data plotting with the plotter function in Mu. Now we’ve added how to plot soil moisture using capacitive touch on Circuit Playground Express using Mu and CircuitPython! If you want to see how to plot the plot soil moisture as your plants dry out over time, you can follow the steps in this page to get your own soil moisture plot up and running!